Deccan Chargers were shaken after the early loss of Gilly, but Gibbs made sure that he is gonna be there till the end and then make his bat do the talking. It was once again the old horse Kumble who came into the attack and removed two wickets in quick succession and once again road blocks for the Chargers, and I should say that I loved to see the replays again and again when Rahul Dravid dropped a sitter of Symonds at the slips and Symonds thanked Dravid with a huge six the very next over, things seem to gain speed for the Chargers but then the unfortunate dismissal for Symonds applied the brakes and hence the scoring rate was not that good. The last over too was not that productive and Deccan Chargers managed a meager 143 and if history has to be believed, Royal Challengers who buried Chennai the previous game by chasing 146 in 18.5 over’s, I too thought that this is going to be a cake walk to them. Royal Challengers came with all guns blazing with Kallis and Manish Pandey started to inject poison in the wounds of Chargers who have not put a commendable total, but a mis-timed pull by Kallis which shattered his leg stump triggered the fight back by Gilly and his men. The body language of the Chargers seem to be electric and they decided to give it back to the Royal Challengers in their own style, Pragyan Ojha pulled out a stunner from his bag to remove Manish Pandey and Van De Merve and at this stage Satish was singing "We will ... We will ... rock you ... We will ... We will ... rock you ...", I know I have to intensify my prayers and so I did the same and the result was pretty evident the very next over when Rahul Dravid was dismissed by Harmeet while attempting to glance a ball to the leg while it pitched between the off and middle, Gilly's reaction to that was a "Picture Perfect" moment. Bangalore started to sweat and it was pretty obvious on the faces of the folks who were sitting at the dugout, and our one and only beauty doll Katrina's plan for a great "Hugging" ceremony started to pull its curtains down, she realized that there won't be a chance to hug anyone as her team kept losing wickets at regular intervals. The last over by RP Singh was a real beauty as he did not allow the Royal Challengers to freeze their arms and go for the on-slaught, when the last run was pushed on to the long-on for a single, the celebrations broke out at the Deccan Chargers dug out and also in my apartment, I called up my neighbor who teased me when Chennai lost to Royal Challengers and it’s time for me to reciprocate, so I too called him up and offered my condolences, on the whole my prayers for a Banglore's defeat has been answered and I am all thrilled about it. I can now go to office with my heads-up and tease all bangaloreans to the extent possible. Thank you IPL for keeping our entire country entertained and divided for the past 34 days, we would certainly welcome you back the next year and till then it Good Bye!! 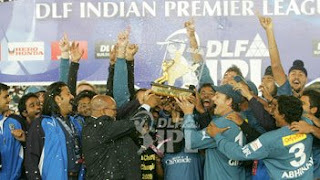 but remember bangalore did not lost the game as chennai. It was thrilling upto last over. bangalore is up on the ladder from 2008 to 2009.
and chennai are losers than 2008! !